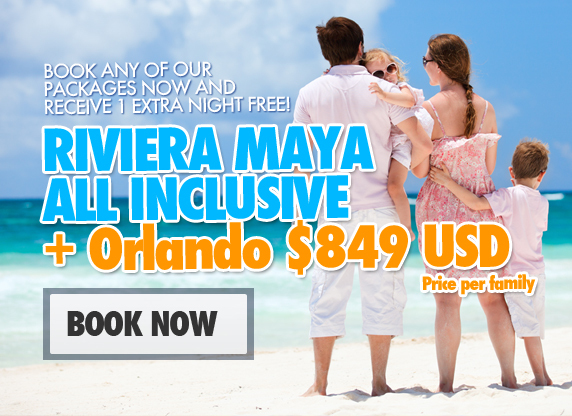 All Inclusive Riviera Maya + Orlando $849 Family Rate! The Endless Luxury all inclusive vacation package at Hacienda Tres Rios Resort combines warm hospitality with luxurious room accommodations, exclusive access to Tres Rios Nature Park, and an incredible gourmet experience. Hacienda Tres Rios features a variety of enticing restaurants and bars which serve international cuisine and a patisserie, a pizzeria, and the Martini/Tea Terrace. Orlando is a perfect family vacation destination. Activities include shopping, golf, museums, theater performances, festivals, and Florida’s beaches are less than an hour away. There are endless options for dining, entertainment and nightlife. Orlando’s number one attractions are its incredible theme parks, from Walt Disney Worldand Universal Orlando Resorts to SeaWorld Orlando and Legoland Florida. Go behind the scene and screens and become part of your favorite movies and television shows at Universal Studios.